These cables include a molded M12 connector and a length of thermocouple extension cable. The molded connectors are available in straight or right angled configurations, and in male (pins) and female (socket) connections. Please note that for use with any of Omega's M12 Thermocouple Probes, cables need to have a female connector in order to connect properly to the probe's male connector. Note: * All standard models are provided with a connector on one end and stripped leads on the other. For longer cables, change the last number in the model number to the desired length in meters and add $2 per meter to the price. 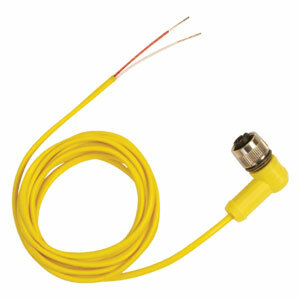 For IEC colors, add “I” after the thermocouple type (ie “KI”) at no additional cost. To add a traditional pin-style thermocouple connector to the stripped lead end, add “-SMPWF” or “-SMPWM”, “-OSTWF” or “-OSTWM” to the end of the part number and add $5 to the price. To add an M12 connector to the stripped end add “-SF”, “-SM”, “-RF” or “-RM” for an additional cost of $10.